Hello! I am a wife, a mom of two wild and crazy toddler boys, a paramedic, an equestrian, a animal rescuer and most importantly a Christian. This is my journey of tackling all of this while being handed the not so great card of autoimmune disease. I hope you find motivation, inspiration, love and laughter. 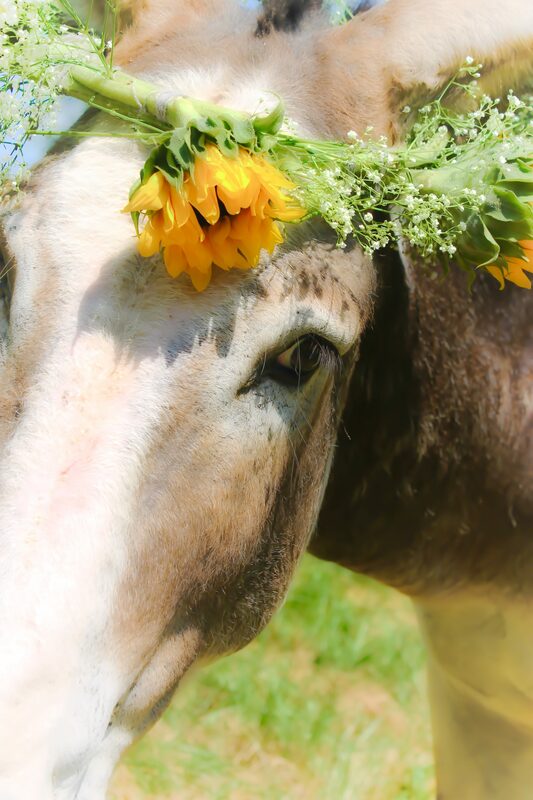 Most of all "Eat, Bray, Love" and watch my rescue donkey show you what spirit and love is really about . Growing up a Southern Girl, Easter was the biggest shopping event of the year. Finding that perfect pastel dress with just the right amount of lace, some dainty lace gloves and Lord forbid you forget a hat….you MUST have a hat that matches your dress. This level of shopping is even more fun when you have kids. My husband, bless his heart just doesn’t understand. My boys lack enthusiasm as I make them try on their fourth pair of searsucker pants because it HAS to be the *right* shade of blue after all. By Sunday morning the entire family is looking spiffy and clean and of course all matching each other. You just cannot claim to be a proper Southern wife and mother if you let your family show up to church mismatch on EASTER SUNDAY! The horror!! Now, things are a lot different now then when I was younger- we now have social media and I am as guilty as the next. We set our alarms a whole ten minutes early just so we can have time to pose for the *perfect* family picture. You know, the one where everyone is smiling in their Sunday best and the caption on social media is “my kids are the best! The are SO sweet” while behind the camera you had a hand strategically placed on the oldest ones thigh threatening to whoop their behind if they act out and Lord help them if they get that searsucker suit dirty before church…. So here’s my question for you….what is behind that instagram photo of your perfect family going to church on Easter. You are presenting this picture that your family is the perfect Southern family who loves their God and Family. Is that a picture , an Instagram lie, or is it real? What is going on behind that camera? Do you pray with your children and for them? Do you go to church because you have to or because you are so thirsty for God that you WANT and LONG to go ? After the sermon is over, you are sure to go home or to the families home for the big Easter get together and of course the Easter egg hunt. You’ve most likely spent time on Pinterest looking for the coolest Easter egg dying trends …..you know, the ones you can post and get the most likes from. Are you really enjoying this time with your kids or are you fussing the whole time because they dont do it exactly like you told them or they are getting too messy? When you fix that Easter basket do you include in a book or something about the REAL meaning of Easter? There’s nothing wrong with doing all these things for Easter. But I challenge you to look beyond the “perfect picture”. Look at what Easter really means to you. Do you REALLY believe in God and the fact that he sent his son to die for your sins? Do you want to get your family dressed up for that instagram picture or because it is a symbol of how Jesus came to make us all new? This Easter, as you are doing all these things…ask yourself-Why? Solace…as I was milking our goat late last night the moon babarely flickering through the clouds, the rain pinging lightly on the tin roof of the barn- I was covered in immense calm-solace. In that moment I was grounded…rooted to something stronger than any amount of depression or desperate inhibition. It was just me , God and the animals. Everyday we hear of someone committing suicide. This week was the two Parkland survivors and the father of one of the Sandy Hook victims. I cried reading the stories about them. It was devastating. I cannot imagine the amount of desperation that they felt…the emptiness…of knowing that their loved ones were gone. I really cant imagine being the father whose daughter was gunned down. He tried to find his Solace by researching violent behaviors on a neuroscience level….he did amazing things for everyone else but he couldn’t help himself. Oftentimes we are like him, especially those of us that are first responders, we help everyone but we can’t dig ourselves out. We dont give ourselves time to find solace and then we lose ourselves. On my end, I never wanted to come out and ask for help. After my chikdren were born …like 24 hours after…I was not myself. No one tells you how much you will cry and how much you will HATE your husband for sleeping (love you dear) but gosh do you ever. I remember carrying Wesley around attached to my breast walking laps while hearing David snore…talk about wanting to plot someone’s death (j/k) . What I’m getting to is depression comes in all forms and sometimes can be hormone fueled BUT it is still depression. For me I got the double dose-anxiety from being a medic and having been a magnet for bad pediatric calls and then having post partum depression. I knew I had to find solace. All of these people want to say “you aren’t alone” “why didn’t they talk to someone” the thing is they probably tried but they were too busy appearing bubbly and happy. Depression happens in all forms with many faces and we ALL go through a rough patch at least once in our lives. So…find your solace. Step away. Put your phone down and walk. Get away. For me, it’s my animals, everyday after the boys are a rep I switch their camera on so I can watch them and go to the barn. I brush my horse and donkey. I milk my goat. I talk to God. I find God in those moments and He is my Solace…what is yours? Hands…what have yours done? Do you ever think about them? Do you ever appreciate what your hands have accomplished? Honestly…I haven’t…until today. The biggest part of Ankylosing Spondylitis is joint swelling, extreme pain and fusion of joints. These are mainly large joints but my hands and feet are beginning to be affected. Today, I cant wear my wedding band because of swelling so I bought some cute silicone rings to take its place…today I can’t work on the crocheted baby blanket for my best friend. Days like today get me …..but then I think about what my hands have done in 29 years and -holy WOW…if I lose all function today, I know my hands have helped me to do more than most people ever have the chance. These hands have taught colts to lead and then to saddle and then to ride. These hands have held the reins on a horse a few days off the track and taught him to enjoy retirement. These hands have held four reins of a double bridle and trotted into a ring full of cheering people. These hands have shook as I rode a five gaited horse for the first time. These hands have held hands-of young, of old, of sick, of dying…they have been the first and the last touch. They have performed chest compressions, intubation, ventilation, IVs, drawn up medication, given medication, dried tears and have folded in prayer beside a dying patient. These hands have held my husband’s hands as we became one and then held our sons as they were born. These hands have carried babies then toddlers, soothed boo boos and rocked bad dreams away. They have made shadow puppets on the wall and made playdough airplanes and dinosaurs . These hands have taught lectures and scenarios and helped students learn to use their minds as well as their hands. These hands have rescued animals and nursed them back to health . They have thrown hay and pitched manure. These hands have tried and failed and tried and won. These hands have folded in prayer and raised in praise. Today they held an older patients hands because she was anxious and they hugged her and let her know we were there. Today they worked on my best friends baby blanket but then failed. Today they are swollen and stiff and painful…specifically the left one. BUT I will keep using them but I also want to keep remember all the awesome they have done. I always tell patients that I’m simply God’s hands. I do not save them- God does…but he gives me the mind and hands to do so. God gave us some amazing power in our hands. What good will your hands do today? What have your Hands done? Growing up, my grandma Davis talked ALOT about ghosts, angels and seeing visions of people who had passed. I dont know where you stand on the matter but I know God talks about angels speaking to people or through people and I really think Grandma had this kind of connection with God….well, maybe Wesley does too. I like to think that God uses our children as a catalyst of sorts. A way to remind us that He is real and also to knock us down a peg when we think we actually have this parenting thing down pat. Wesley , my oldest, just turned 4 last week. He’s brilliant-and I’m not just saying that because he is my child- he is one of those kids that notices everything and remembers it. He can name all the major organs in the body and he can explain what most of them do. He has a level of sympathy and empathy that most adults can only hope to fake. He’s an animal whisperer who can make friends with anything that breaths…its incredible and awe inspiring. He really is my piece of heaven-my tiny , wild, all boy, blessing. I see so much of my mom and davids dad in him. Their spirits seem to make him who he is. Then he does things that really stop me in my tracks. Kids say the darndest things and sometimes those things seem unreal. Today, as we were watching TV, he just looks at me and says “mom, God likes to fish. He has this BIG pond by his barn and he goes and fishes in it”….. So I press a little. Ok so now I’m crying because I miss my Georgie goat and my baby chick that randomly died last week and I definitely miss my Justice girl. This story went on for a good ten more minutes. I just boohooed the entire time . I mean, I don’t have a logical reason for Wesleys insanely accurate description . I do know that he had never seen Grandma Davis and can point to a picture of her and know EXACTLY who she is without even blinking. Maybe its her, maybe it’s God or maybe its a combination. But if you need a good reminder of why to not take this life for granted then save and share this story. It might just be a story a toddler made up-a toddlers perception of grief- or it could be God’s way of saying- hey dont forget me. But I’m not chancing it. I love when people ask about the farm. I love when their eyes light up at the idea of fresh food and no neighbors. At the end of our conversation, they always say “I hope to buy some land and have my own farm one day”. That’s awesome! You should do it! You will love it-25% of the time. You want a farm, but do you really want to be a farmer? I spent my childhood following my papaw around milking cows and collecting eggs. I learned to pluck a chicken and then butcher it. I learned to raise a steer calf with so much love and then help bag his meat for the freezer. Springs were the best- mommas having babies! Cows, chickens, ducks and geese all had babies at their side. I watched the calender every day waiting for the circled date to come around because that’s when calf watch would start. It was amazing. At home, we didn’t “farm” but we always had a garden and horses. I spent evenings, after school, down at the barn riding until dark. Show season was fast paced and life changing. The dirt and sweat and bruised behinds were all worth it come Championship time. After all- hard work pays off. I always knew I wanted it all-the entire farm- ALL the animals. Lord bless my husband when he married me- he had fair warning. It took several years but we bought our dream farm and I started filling the pastures up with rescue animals. Animals that needed a second chance. Pappy-my Donkey was the first. The boys then got dairy calves from Santa with the hope that they will compete in local fairs with them. I know one day they will want to do beef cattle and even though I get attached- that fresh beef will be amazing- and we will eat it knowing that that animal was LOVED and PAMPERED and humanely used for the purpose that God intended. I am sure that will be a few years. It all sounds pretty awesome, right? You are on board to be a farmer right? Well what about when your rescue goat that you dearly loved becomes suddenly sick and collapses and you spend all night sleeping with him just to make the decision to euthanize the next morning? Or when hawks are on a daily buffet of your baby chicks that you hand raised? Or when coyotes kill 7 of your prized Sebastopal geese and leave their bodies scattered. What about when you have to give injections to your sick calves or goats and you have both kids and no one to help? What about when the pasture floods and trees go down and you are tired but you strap a baby to your back and a toddler by your side and round up animals? Do you still want to be a farmer? What about when spring comes and you loose a momma cow or goat or sheep during birth and you spend all night finding colostrum or formula ? It is hard. It is so incredibly heart breaking. Today I sat with one of my chickens wrapped in a blanket as she seized and died…I have no idea what happened. THAT makes farming worth it. That 25%. That little slice of time without blood and tears. That solid week without calling your vet at 10pm……That makes you go from a regular person to a farmer. So. Do you want to be a farmer? It’s spring in winter time here in North Carolina. The days are 70 degrees and the nights are 30. After I get the kiddos to bed, the night is me time. I step outside and the harsh cold hits my face as wet as walking under a waterfall. Rain drops fall sporadically but not enough to make you soaked. It’s cold but not winter coat cold- more muck boots, leggings and sweatshirt cold. I stuff some carrots in my pockets and step out. My steps creak and moan , my feet slip slightly on the wet leaves that coat my porch steps. I start down the hill to the main barn where Gracie and the moo cows are. I peek in at the goats as I pass their lot and they make low mumbles as if asking why I’m still awake- I wonder the same thing. I make it to the barn but leave the lights low. I give everyone a scratch and get Pappys food for the night. Walking to Pappys lot is a trek. Normally the cows are there but we switched them so we could get them vet checked easier. It’s a big barn way at the top of the hill. It’s more designed for cows and goats as it is open and has its own attached pasture. Most nights, I cant make the climb so David feeds him when he gets of work but tonight I felt good. The air is crisp and I blow out so much steam as I pant up the hill. I stop several times to get my wind. Pappy has his head stretched over the pasture gate and starts braying at me. He sounds quite like his bray is broke as he yawns out “heeeeeeehaaaaawwwww” I open the gate and I am greeted by a big wet head and floppy ears. He prods me knowing I have food and treats . You can so easily focus on the sound of his muzzle moving the grain back and forth. There are no other sounds. The air is still except for the ever so random pitter patter of rain…it is calm. It is the essence of love. This week is Valentine’s day. What if we can take “me ” time and listen to the raindrops and to pay attention to how the rain lines the leaves and the sound of them sliding under our shoes. Maybe we can focus on that instead of flowers and dinner . There is so much to step back and appreciate. On nights like tonight, in the silence of the barn, I realize that I am so BLESSED. When was the last time you went outside after dark-after the kids were in bed- just to stop- and to think? Try it. Write down everything you notice and then rediscover love and your life. There’s this group of insanely strong and determined women that have one thing in common- infertility. Many try and try and never get to hold a baby of their own. They go through months and years of pills, injections , IVF and negative tests. These women have a patience that I envy. I have many friends who have never held a test with two pink lines-or worse- those pink lines fade several weeks after conception due to miscarriage. Then there is me. In my first few years as an “adult” I was told I would require fertility meds to get pregnant…so I was prepared…then the honeymoon surprise baby happened 😂. Two years-almost to the day- our second baby boy came screaming into this world. Neither required medication to be conceived. We are SO BLESSED but I can’t help feeling that God is telling us to not close up shop just yet. About a year ago we started “trying” for the third and last . I’m on month 4 of clomid, an infertility drug aimed towards PCOS and still no pink line. It’s depressing and frustrating and disheartening. Then it’s easy to feel guilty. “I should be happy I have my two boys, most have none”… “Why would God bless ME with another one when so many of my friends -who are far better than me in their walk with God- can’t even have one child”??. Then I think of how unfair it is and I argue with God. Why do I have two healthy boys and my friend can’t maintain a pregnancy? Why can people get pregnant and just kill their babies without a care in the world? Why are children in foster care? Why is it so expensive and red tape covered to adopt a child but killing one or abandoning one is a flick of the wrist. Hear me out- IT IS NOT FAIR. Every night Wesley asks God for a baby sister and I quote” God please can I have a baby sister? Oh and a airplane to share with her. I promise I wont hit her” 😂toddler logic . We have been reading the book of Genisis this week. Specifically about Sarah and Abraham and the miraculous birth of Isaac. God granted the desire of her heart even though she was far too old and barren. So we have been praying hard. We have been praying for not only our desires but God’s. Did you know that when Isaac was older, God told abraham to kill Isaac and sacrifice him unto him…just to see if he would trust him? God gives us trials…He wants us to give 100%. So…I don’t know why I really wrote this today. I dont really care for the world to know about our infertility struggles. After all I still feel ashamed because to me I should “just be thankful” that I have 2 healthy boys. But I felt that God wanted me to share this. To share that maybe you aren’t alone. Maybe you have been trying forever and its not working and you are giving up. Read about Sarah and Abraham. Trust, pray and fast. I know I am. If we are blessed again, a boy will be Isaac for I am praying to have Abrahams faith…and a girl with have the middle name Marie for Mary because through her pregnancy she had the faith that any mother should have. If you are struggling too…please reach out. I will pray with you and for you.